We noted earlier in the year (here and here), that the $2 trillion in mortgage resets won't impact the consumer as much as many fear. "As home prices appreciated from ridiculously high to unbelievably higher, more Americans began using mortgages that allowed them to buy more house for less of a monthly payment. Next year, a large portion of those rates move up and homeowners who opted for the exotic mortgages could find their payments doubled. Talk about bloody. They need to find a way to minimize the pain. Many will refinance their loans. But for others, whose mortgages now exceed the value of their homes or whose debt payments exceed 40 percent of their incomes, there may be no other solution than to get out of their houses. With the housing market cooling, selling it may not be easy. Some may default on their loans. With more homes on the market, prices could begin to fall. That reduces home equity — the difference between the amount borrowed and the total value of the home — and could force people whose loans change in 2008 and 2009 to consider selling, further accelerating the drop in prices. Some of those cities with the highest proportions of interest-only loans are also at the greatest risk of falling prices." (emphasis added). "In 2003, of all new mortgages, 10.2 percent were interest-only, meaning the homeowner paid only the interest for the initial period of the loan. According to Loan Performance, a research firm, 26.7 percent of all loans were interest-only last year and another 15.3 percent were payment-option adjustable rate mortgages, which allow homeowners to choose how much they paid each month." 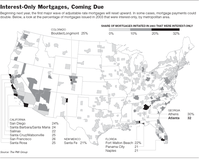 The problem is more concentrated in some regions: "In most California cities, as well as in Denver, Washington, Phoenix and Seattle, interest-only loans represented 40 percent or more of all mortgages issued in 2005." "Traditionally, interest-only loans and adjustable-rate loans were used by people who expected to live in a house only a short time, but such loans have turned into “affordability products” as housing prices rose. The interest rate on the loans, while below that of conventional 30-year fixed-rate mortgages at the beginning, resets after 3, 5, 7 or 10 years, depending on the loan. So, homeowners who took out loans in 2004 could find, for example, that their initial 4.25 percent loan climbs to 6.25 percent or 7.25 percent next year. Someone now paying $350 a month for a $100,000 interest-only loan could be facing payments of $680 both because of the shift to the higher rate and because the borrower would have to start paying off the principal as well as the interest." In any speculative market, one of the key risks is forced sales. In equities, its when the margin clerks walk around a firm, literally hitting bids indisciminately. Its as per legal/regulatory requirements -- if you don't have the cash in the acocunt -- WHACK! The scenario laid out above is similar -- on the margins, a small number of speculative defaults lead to forced liquidations. Since the marginal speculators helped drive prices skyward, its no surprise that the double whack of the loss of speculative buying plus forced selling can impact a neighborhood or even a region (I'm thinking Miami condos and houses in las Vegas) quite strongly. The key determinant as to the impact on a region will be the percentage of people whose "mortgage exceeds the value of their homes, or whose debt payments exceeds 40 percent of incomes." These people may be unable to refinance, and will be ripe for foreclosure. Note that mortgage delinquencies and foreclosures remain low nationwide, including the areas where prices appreciated the most. I don't see how refinancing is going to save a person who got an interest-only loan or ARM in order to afford the payments. Getting either a fixed-interest loan or letting the ARM reset is going to cause they payments to go up, causing consumer pain.